Ordered in 1960, the F-111 was originally a joint program to develop a deep-strike fighter-bomber for the AF and a long range interceptor for the Navy. The F-111 introduced many innovations, it was the first aircraft to have terrain following radar for automatic low level flying down to 200 feet. The first to use swivel wing design for low and high speed regimes of flight. The F-111 had an extended range capability unmatched by other fighters at the time. With the introduction of the F-111F with its upgraded avionics and terrain-following radar, more powerful engines, and armed with laser-guided bombs that the F-111 emerged as a superb long-range strike aircraft. It was these aircraft that flew air strikes against Libya in 1986, Iraq (Desert Storm) in 1991 and the EF-111 aircraft in Iraq (Desert Storm) in 1991 and Bosnia in 1995. About 540 F-111s were built in various models with the Australian Air Force still flying their F-111C models today. 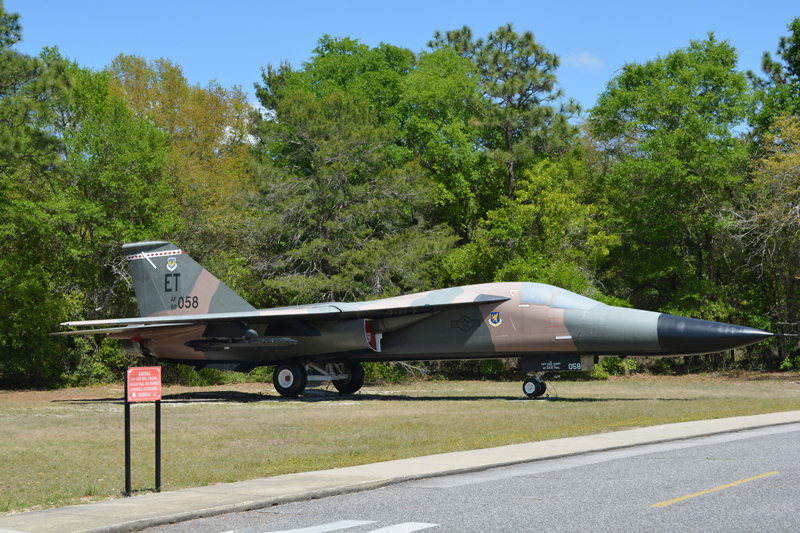 This F-111E model aircraft, S/N 68-0058, was one of 94 F-111E strike models built. This aircraft was last flown by the 40th Flight Test Squadron stationed at Eglin AFB,FL.